Over the centuries of waning power and influence, the Khazar peoples began to emigrate in many directions. The Khazar ‘Jews’ were confined to ghettos as a result of papal dictat in the mid-16th century.After the demise of Khazaria, the Ashkenazi did not speak the Semitic language of Hebrew at all because they were not original Hebrews.They developed their own tongue called Yiddish, whch is the language of the Ashkenazi, and it did not come from Israel, but from Germany and Eastern Europe. 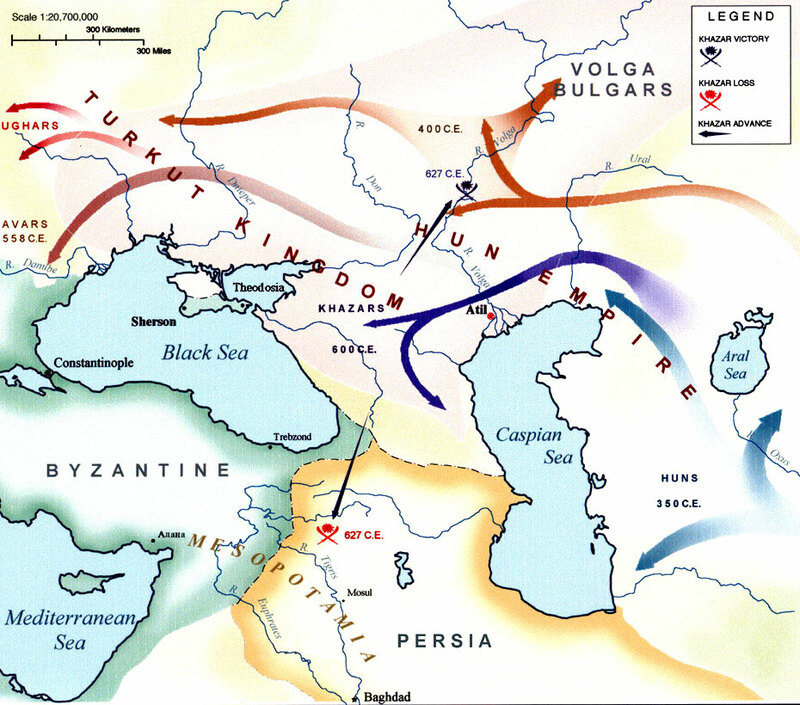 In 965 AD, as the Qağanate was struggling against the victorious campaign of the Rus’ prince Sviatoslav, the Islamic historian Ibn al-Athîr mentions that Khazaria, attacked by the Oğuz, sought help from Khwarezm, but their appeal was rejected because they were regarded as ‘infidels‘ (al-kuffâr pagans). Save for the king, the Khazarians are said to have converted to Islam in order to secure an alliance, and the Turks were, with Khwarezm’s military assistance repelled. It was this that, according to Ibn al-Athîr, led the Jewish king of Khazar to convert to Islam. The vast territories of the Russian Empire at one time hosted the largest population of Jews in the world. Within these territories the primarily Ashkenazi Jewish communities of many different areas flourished and developed many of modern Judaism’s most distinctive theological and cultural traditions, while also facing periods of antisemitic discriminatory policies and persecutions. Russian Jewry consists predominantly of Ashkenazi Jews but also comprises a number of other Diasporan Jewish groups, such as Mountain Jews, Crimean Karaites, Krymchaks, Bukharan Jews, and Georgian Jews. The presence of Jewish people in the European part of Russia can be traced to the 7th–14th centuries CE. In the 11th and 12th centuries, the Jewish population in Kiev, in present-day Ukraine, was restricted to a separate quarter. Evidence of the presence of Jewish people in Muscovite Russia is first documented in the chronicles of 1471. During the reign of Catherine II in the 18th century, Jewish people were restricted to the Pale of Settlement within Russia, the territory where they could live or immigrate to. Alexander III escalated anti-Jewish policies. Beginning in the 1880s, waves of anti-Jewish pogroms swept across different regions of the empire for several decades. More than two million Jews fled Russia between 1880 and 1920, mostly to the United States. Jews have been present in contemporary Armenia and Georgia since the Babylonian captivity. Records exist from the 4th century showing that there were Armenian cities possessing Jewish populations ranging from 10,000 to 30,000 along with substantial Jewish settlements in the Crimea. The presence of Jewish people in the territories corresponding to modern Belarus, Ukraine, and the European part of Russia can be traced back to the 7th-14th centuries CE. Under the influence of the Caucasian Jewish communities, the Bulan, the Khagan Bek of the Khazars, and the ruling classes of Khazaria (located in what is now Ukraine, southern Russia and Kazakhstan), may have adopted/converted to Judaism at some point in the mid-to-late 8th or early 9th centuries. After the conquest of the Khazarian kingdom by Sviatoslav I of Kiev (969), the Khazar Jewish population may have assimilated or migrated in part. The Russian Empire hosted the largest population of Jews in the world isn’t this another proof that the Ashkenazi Jews are not Semites and they are Asian Turkic? If so then Antisemitism is actually Anti-turkism. 1- The History of the Jewish Khazars, New York: Schocken Books, 1967, by D. M. Dunlop. [For the sober historian speculation about what might have been is a frivolous distraction, but for those of us with less responsibility it has its charms. What would have happened if Xerxes’ invasion had been successful, or if Charles Martel had not driven the Moslems back behind the Pyrenees, or if the Russians had adopted the Christianity of Rome rather than of Byzantium? With these questions we are familiar. We are less familiar with the questions that the Khazars suggest. What would have happened if the Khazars had not kept the Moslems from breaking out north of the Caucasus, or if they had been able to maintain their state, or if their kin the Turks, Bulgars, and Magyars and their neighbors the Russians had followed the example of their rulers and aristocracy and adopted Judaism? These are idle questions, of course, but they are not fantastic. The Khazars were not a myth invented by Judah ha-Levi in the 12th century as a convenient narrative vehicle for his theology. They are not even an invention of the Arab League, which would have it that modern Jews are descended from them rather than from Palestinian ancestors; or of American anti-Semites, of whom some now refer to “Khazars” as they once referred to “Eskimos,” for coy concealment, and others try to invest the name with an uncanny and sinister quality. From the 7th century until some hundreds of years later the Khazars were a power where Asia Minor meets Europe. Mr. Dunlop, citing Constantine Porphyrogenitus, reminds us that in the 10th century letters to their ruler from the Byzantine court, for which ceremony was no trivial matter, “bore a more handsome gold seal than that judged necessary for correspondence with the Pope of Rome or the successor of Charlemagne.” Khazar princesses were wives and mothers of emperors in Constantinople, and more than one Caesar of the Eastern Roman empire was enthroned with Khazar support. Douglas Morton Dunlop (1909–1987) was a renowned British orientalist and scholar of Islamic and Eurasian history. Born in England, Dunlop studied at Bonn and Oxford under the historian Paul Ernst Kahle (1875–1965). His work was also influenced by such scholars as Zeki Validi Togan, Mikhail Artamonov, and George Vernadsky. In the 1950s and ’60s, Dunlop was Professor of History at Columbia University in New York. He is best known for his influential histories of Arab civilization and the Khazar Khaganate. Dunlop was the “most esteemed scholar of the Khazar monarchy.” He had command of the many languages needed to study the Khazars, information about whom is found in Arabic, Byzantine, Hebrew and Chinese literature. 2 – The Invention of the Jewish People (Hebrew: מתי ואיך הומצא העם היהודי?‎, Matai ve’ech humtza ha’am hayehudi?, literally When and How Was the Jewish People Invented?) is a study of the historiography of the Jewish people by Shlomo Sand, Professor of History at Tel Aviv University. It has generated a heated controversy. The book was in the best-seller list in Israel for nineteen weeks. It was reprinted three times when published in French (Comment le peuple juif fut inventé, Fayard, Paris, 2008). In France, it received the “Prix Aujourd’hui”, a journalists’ award given to a non-fiction political or historical work. 3 – Two Hundred Years Together (Rus. Двести лет вместе, Dvesti let vmeste) is a two-volume historical essay by Aleksandr Solzhenitsyn. It was written as a comprehensive history of Jews in the Russian Empire, the Soviet Union and modern Russia between the years 1795 and 1995, especially with regard to government attitudes toward Jews. Solzhenitsyn published this two-volume work on the history of Russian–Jewish relations in 2001 and 2002. The book stirred controversy, and many historians reported it as unreliable in factual data. Some historians classified it as antisemitic, while others disagreed with this. The book was published in French and German in 2002–2003. A partial English translation of some excerpts may be found in “The Solzhenitsyn Reader”. Search of a Jewish Identity, is not shy about his claim: Yiddish has Slavic grammar, syntax, morphemes, phonemes, and lexicon, with a smaller input from Turkic. Wexler made the case that Yiddish is a “relexification”—a massive borrowing of Germanic words onto a basically Slavic structure, as opposed to Weinreich’s view that Slavic words were added to a Germanic structure. Wexler’s claim applies not only to the language: “The bulk of their [Ashkenazi Jewish] religious practices and folkways also prove to be of Slavic origin” and thus “the Ashkenazic [sic] Jews may be in the main ethnic Slavs”—Wexler added his own italics, in case readers should not get the point. Wexler’s preferred term for modern Judaism was “Judaized pagano-Christianity,” though he used the term rarely on the grounds that it was too cumbersome. 12- Interview with Doctor Anthony C Sutton on his research about the funding of Nazi party and of Soviet communists by a group of American and European financiers and industrialists. with all my respects it is clear that the Jewish Khazar wanted to annihilate Germany by supporting the Nazi financially and create WWII and defeat Germany and bankrupt all Europe to get on top. The Nazi were already defeated when they got assistance from the Jewish Khazar bankers.